This is a very rare stone....a nodule of Azurite and Malachite. It is the first one I have seen as long as I have been making art jewelry, or 11 years. I wrapped it in Sterling and it hangs from Sterling Chain. The colors are very deep and rich at the same time. Actually it is the first one I have seen like it. 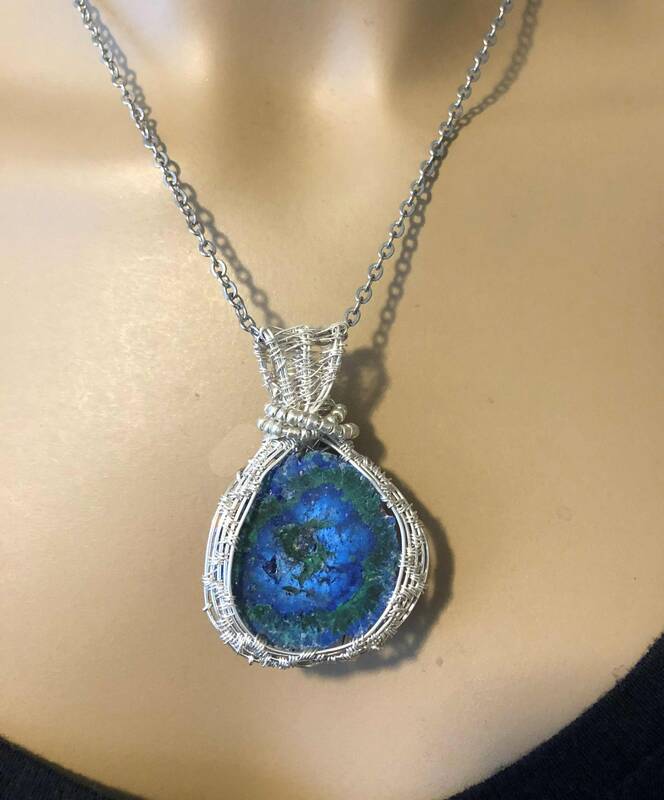 It hangs from a sterling chain and it is wrapped with sterling wire. Including the bail it is 2"x 1.25". 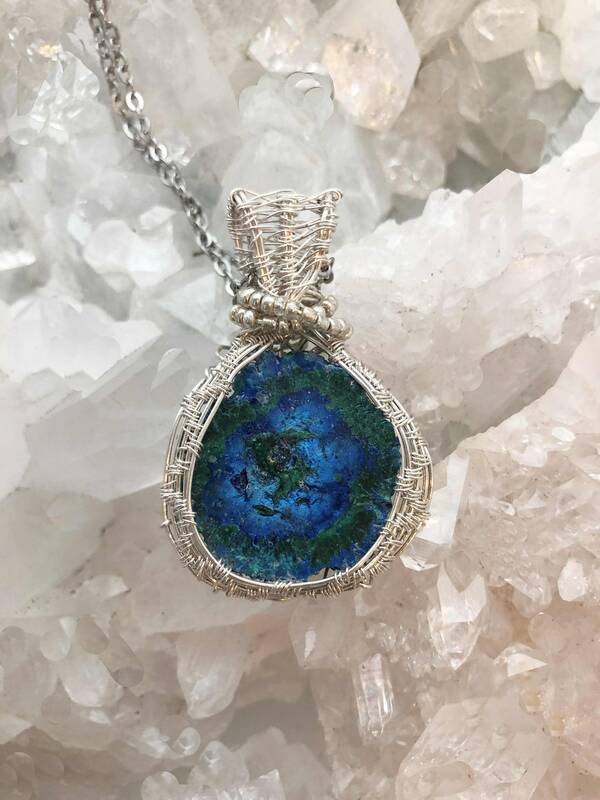 Azurite Malachite is a combination of two distinct and well-known gemstones: the deep and rich blues of Azurite and the green shades of Malachite. This stone’s name can also be shortened to Azurmalachite. It’s often carved into objets d’art and cut into cabochons. Azurite Malachite can usually be found in the USA, China, Central America, Southeast Asia, and Africa. The combination of Azurite and Malachite creates a mineral which is known to exhibit the properties of each stone, and a few additional ones that come uniquely from this synthesis. Azurite is also known as a stone of heaven. It will give insight in all areas of your life, and it will stimulate your creativity. It will enhance your intuition and get rid of all the blockages that are preventing you from living the life that you want. It will remove your coldness and replace it with feelings of love and compassion. Malachite’s striking green color will encourage you to take action and allow change to happen. It will also give you emotional healing and allow your spirit to fly free. 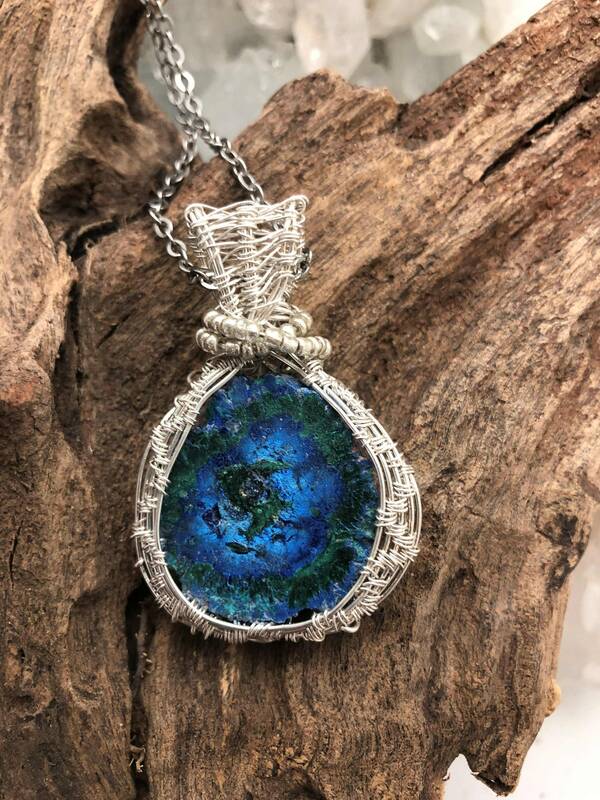 Azurite Malachite will combine different traits and give you a fresh outlook on life. It will eliminate your egocentric traits and get rid of your vanity and conceit. This stone will also calm your anxieties and promote flexibility in your thought and actions. Azurite Malachite is very calming and soothing to your emotions. It will also enhance your psychic abilities. It’s a very good stone to use for all healing purposes. It’s also superb when it comes to healing both physical and emotional trauma. It has quite an absorbent and welcoming nature. You can simply put a piece of Azurite Malachite on the affected area of the body and it will draw the trauma out. Azurite Malachite possesses a very centering energy. It’s an excellent stone to help you find your place in the universe. It will keep you well-rounded, grounded, and nurtured, and it will help expand your horizons. It will also act as a bridge between your intuitive and intellectual aspect. When it comes to physical healing, Azurite Malachite can be very effective in healing muscle and bone injuries. It can increase blood-oxygen levels and help in repairing damaged brain cells. It can also address bone and joint problems and cure sore throats. Azurite Malachite is known to heal the kidneys, thyroid, and gallbladder. Its healing energies can help improve your eyesight. It can also aid in digestion and ease the symptoms of diabetes and hypoglycemia. It can also protect you from radiation illness, tumors, arthritis, and asthma. Azurite Malachite is also associated with wealth and abundance. Wearing or carrying Azurite Malachite jewelry will bring you prosperity, which is why it’s also known as the businessman’s stone! Its healing energies will uplift your spirits and clear the confusion in your mind. It will help you come up with new ideas on how you can resolve your financial problems and how you can bring back your motivation in what you are doing. This stone will bring prosperity in business and give you support in turning things around when your finances are not doing well. Azurite Malachite is said to encourage fresh perspectives and clear understanding, expanding your mind by helping you let go of your old and unhealthy beliefs. It’s also a powerful emotional cleanser that will remove your past traumas and help you heal them. It will transmute negative emotions by bringing peace and harmony back in your life. Azurite Malachite is a powerful conductor of energy, and it will help you reveal negative emotional thought patterns so that you can cleanse and heal them. Azurite Malachite is a very protective and centering stone. It will act as the mirror of your soul and attest to the truths that are within you. It’s a physically protective stone that will make sure you are safe in every sense of the word. It will help you keep the joy and happiness in your life, no matter what it is you’re going through. This stone is an emotional purge and will clear any kind of emotional blocks. It will absorb the negativity, release them, or transmute them. Azurite Malachite is an excellent stone that will help you get in touch with your emotions. But make sure that you wear it when you’re feeling emotionally high because it can amplify emotions. Using this stone can help you counteract your self-destructive tendencies when it comes to love and relationships. It will also inspire genuine and pure love. It will enhance your emotional balance and stability. It will also get rid of your tendencies to be distrustful, jealous, or insecure. This stone is especially beneficial when working with the heart chakra because it emits the right kind of energy pattern that will stimulate and balance the heart chakra.